Famous for attractions and entertainment venues the Orlando area is also home to some extraordinary natural parks and natural wonders. LAKE TOHOPEKALIGA: Approximately 30 minutes drive from our vacation homes. Only minutes from the hustle and bustle of Orlando, visiting Lake Toho is like stepping into a different world. At over 19,000 acres it is one of the larger lakes in Florida. Nestled on the shores, wildlife and birds abound. Take a narrated nature cruise or opt for one of the fishing cruises. 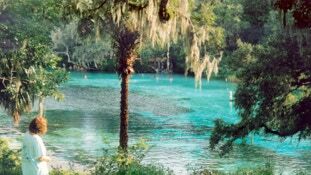 WEKIVA SPRINGS: Approximately 40 minutes drive from our vacation homes. Spring fed waters flow through the shade of an ancient semi-tropical forest. The 8,000 acre park has over 13 miles of hiking trails through distant terrains. The park also offers horseback riding, bird watching, fishing, kayaking, and canoeing. Of course you can also swim in the crystal clear springs where the water in the 42 million gallon springs is at least 72 degrees year round. STREET AUDUBON NATURE CENTER: Approximately 40 minutes drive from our vacation homes. This 42 acre park is a haven for bird watchers. Winding nature trails and a boardwalk over the waters of Lake Ned provide excursions into the world of nature, where visitors can observe numerous species of wildlife. Famous for its birdwatching, the conservatory is home to over 140 species of birds, including a flock of bald eagles, red tailed hawk, and green backed heron. ST. JOHNS RIVER: Approximately 50 minutes drive from our vacation homes. The areas’ freshwater lakes and crystal clear rivers provide plenty of opportunities for unique adventures. The 342 mile long St. Johns River is the longest navigable river in Florida. The river basin and surrounding wetlands provide a natural habitat for a wide variety of plant and animal life. In the winter months it is possible to spot the endangered Manatee. Explore the area on a guided nature cruise or rent a boat for your own adventure. BLUE SPRINGS: Approximately 60 minutes drive from our vacation homes. 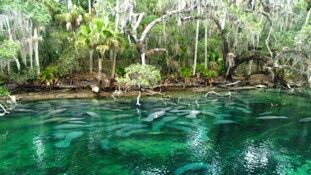 A designated Manatee refuge, Blue Springs is home to several hundred Manatee who take shelter there in the warm waters from mid November to March. The Manatee can be viewed from one of the parks many overlooks. Out of Manatee season the spring also allows snookering and swimming. In other areas fishing, canoeing, and boating can also be enjoyed. RAINBOW SPRINGS: Approximately 90 minutes drive from our vacation homes. Archeological evidence suggests that people have been enjoying this spring for over 10,000 years. 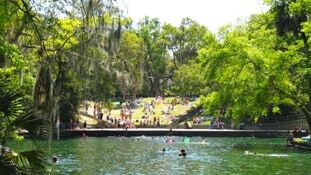 Rainbow Springs is Florida’s fourth largest spring. The Rainbow River is a popular spot for swimming, snookering, canoeing, and kayaking. Canoes and kayaks can be rented at the springs. The park also has picnic tables, grills, and pavilions.